Despite covering only 0.2% of the sea-floor, coral reefs contain 25% of global marine species. These highly productive ecosystems also protect the shoreline from storm surges, supply much of the sand found on Caribbean beaches, and are integral to both coastal fisheries and tourism, supporting the livelihoods of about 100 million people around the world. As live coral disappears, these services are diminished, resulting in economic losses to coastal communities. 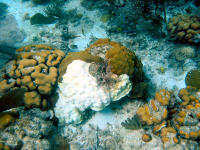 Despite their importance, nearly two-thirds of the Caribbean’s coral reefs are threatened by human activities. Agricultural runoff, over-fishing, dredging, sewage discharge, and the growing pace of coastal development have already degraded important reef systems, resulting not only in a tremendous loss of biodiversity but also lost revenue from declining tourism and fishing, and increased coastal erosion. 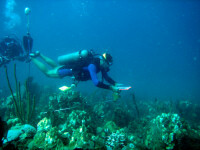 Sadly, according to the Millennium Ecosystem Assessment, 20% of coral reefs have been destroyed in the last few decades and an additional 20% or more are severely degraded, particularly in the Caribbean Sea and parts of Southeast Asia, and revenue from tourism associated with coral reefs has been estimated to be US$30 billion annually. Sea turtles rely on healthy coral reefs for food and refuge, and the survival of some species – the sponge-eating hawksbill sea turtle in particular – is heavily dependant on the survival of coral reefs. 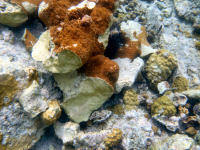 Advocate for strong coral reef protection policies, including monitoring and enforcement. Support the creation and maintenance of marine parks and reserves. Report dumping and other illegal activities. Divers and snorkelers should practice appropriate behavior – do not touch, scar, or remove live coral from the seabed. Follow best practices with regard to construction and maintenance so that silt-laden run-off does not smother nearshore coral reefs, and manage waste water to reduce effluent to the sea. Conserve water – the less water you use, the less runoff and wastewater that eventually finds its way back to the ocean. Maintain high standards for sewage treatment, and emphasize low doses of landscape chemicals. Vessel anchoring should be strictly relegated to non-sensitive areas; suitable moorings should be available. Boaters can minimize damage to the seabed by lifting their motors and drifting, poling, or trolling through shallow areas. Avoid running a boat through shallow areas, consider wind speed and direction, check tide charts and forecasts and create a float plan accordingly, use deeper water or existing marked channels as preferred access, and know the boat’s limitations for running and takeoff depths.